New Braun ThermoScan® 7 is the flagship product of Braun thermometers. 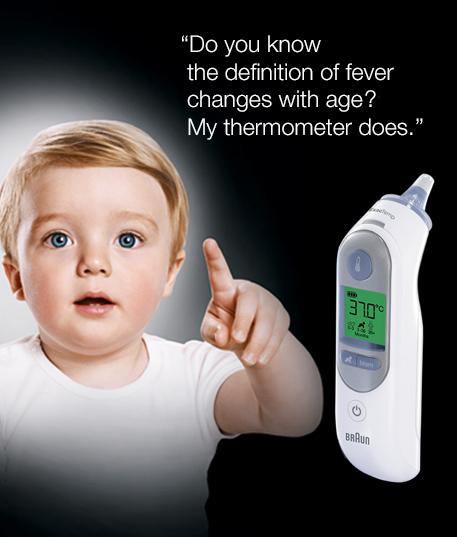 It features the new patented Age Precision® technology – an age-adjustable fever guidance which completely takes the guesswork out of interpreting child’s temperature. Having always used a forehead thermometer I was intrigued and more than happy to put the New Braun ThermoScan® 7 to the test. A few weeks ago, each of my children came down with the flu and it proved to be the perfect opportunity to use it. I loved the fact that it comes with disposable lens filters. It meant that I was able to check each of the children’s temperatures in a hygienic way. They are simple to attach and you just select the age of your child by pressing the labelled button, place the ThermoScan inside the ear and press the button. It alerts you very quickly when the reading is complete and it also guides you by colour. This was really handy in the middle of the night when I felt half asleep. I just found it so easy to use and really trusted it to provide me with an accurate reading and peace of mind. When we had to go the doctors, my youngest child who is 3 years old recognised the thermometer and I was so pleased that she didn’t mind the doctor taking her temperature. Overall, I would highly recommend it to other parents. It is a great, reliable product that is really innovative, easy to use and comfortable for a little one. How About a $200,000 Disney’s Frozen Inspired Playroom for your Little Princess?